to see an exhibition called “Fiery Pool: The Maya and the Mythic Sea” at the Kimbell Art Museum. We enjoyed the exhibition overall, although I will admit to a personal dislike for people who write captions telling you what you’re supposed to be seeing. A fictional example: “This graceful figure holds out a basket of rolled tortillas in a welcoming fashion.” I look at the figure. It seems rather lumpish to me. Yes. It’s holding a basket and I’m willing to admit the contents may indeed be tortillas. However, I see nothing “welcoming” about the way the basket is being held. In fact, as far as I’m concerned, the figure is not even holding them “out.” They seem tucked close to the body to me. Leaving my complaints about captions aside, it was an interesting show. Art ranging from pottery to stone carvings to miniature figures had been chosen for their association with the water creatures, motifs, and the like. There were some interesting audio-visual additions as well. One thing left us rather puzzled. Repeatedly, the helpful caption-writer informed us that sharks were called “xook.” (The “x” is pronounced like a harsh “sh” and the “oo” like the “oe” in “shoe.” English is a weird language; so are transliteration conventions). The caption writer then happily told us (repeatedly) that the English word “shark” is derived from “xook.” I looked at Jim and said, “But what did people call sharks before then? I mean, aren’t sharks common world-wide?” Jim agreed that they were and surely there were other words in use. When we got home, I looked up “shark” in the OED. It listed the first occupancy of “shark” as 1569, but the origin as uncertain. Jim checked an on-line etymological dictionary, which agreed both with the date in the 1560’s and with the uncertain origin. Once again, it seems that our friendly caption writer had been over-ambitious. However, the caption writer may have been right. Cortez arrived in Central Mexico in 1520. The Spanish were involved in trying to conquer the Maya by the mid-1520’s. There are lots of sharks in the Gulf of Mexico and it’s possible that helpful local residents did a lot of yelling warnings of “Xook! Xook!” and the word caught on with the Spanish. 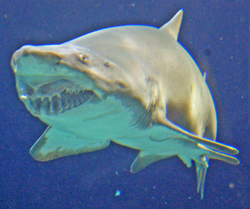 Not being a Spanish-speaker, I can’t tell you what word the Spanish used for “shark,” but the English of the same time period most likely called those big carnivorous sea-creatures “dogfish.” Certainly, “xook” or “shark” would be a lot quicker to say and not as likely to be misunderstood. I can imagine it would quickly become fashionable. artistic Christmas stockings. She had a wonderful idea. She would make a set for herself and my father. Then, when each of her children turned ten, they would get a “grown-up” stocking of their own. Now that I think of it, those stockings were something of a “coming of age” emblem, marking the transition point between the age when the kid would only care to rip the stocking down for the treasures contained inside and the age when he or she would appreciate that Christmas was about more than loot. (For those of you who are coming in late, you might enjoy looking at “Coming of Age,” the Wandering for December 8th. Make sure you peek at the thoughtful comments). Mom also hoped that when the time came, each of her children would make a stocking for his or her spouse. Her plan almost worked. She’d overlooked the amount of time she’d have for fancy work, what with four kids and a huge house, so she didn’t get my stocking made by the time I was ten. I think I was twelve before I received it. However, it remains the treasured heirloom she envisioned. When I married the first time, I made a stocking for my first husband. Later, I made one for Roger. We hung it up for the one and only Christmas he and I spent together. Then, when I married Jim, I made him one. These last three stockings are depicted in the photo as they are displayed in our office: Roger’s on the left, then mine, then Jim’s. Each stocking is special in that the recipient gets to pick what is depicted at the top. My love for animals was set early on, so mine has a reindeer pulling a sleigh. Roger chose Christmas trees and a bear patterned after the southwestern “fetish bear.” Jim loves trains, so his has a train. He’s a graduate of the University of Michigan, so the train is in Michigan’s blue and maize. My involvement with these stockings is far from over. My sister, Susan, has three kids and little liking for fussing with sequins and beads. I happily volunteered to do stockings for her kids. Last year, when my nephew, Daniel, was ten, I made his. Daniel shares Jim’s love for trains and wanted a train as well. However, his favorite color is orange, so his train was to be orange. I didn’t figure this would be a problem, but it turns out that orange sequins are a rare and endangered species unless you’re willing to order them from specialty retailers. I was stubborn. I sent out calls for help. Finally, between a package of mixed sequins my mom found in Virginia and my friends Sue and Hilary Estel looting their craft drawer, we came up with just enough to outline Daniel’s train. Rebecca is due for her stocking next year. I’m going to insist on no orange! Making Christmas stockings is not my only holiday tradition. Jim and I decorate our house with cheerful abandon. Not surprisingly, there are a lot of animals in our decorations, including two holiday Breyer horses, numerous cats, and carousel figures. This year’s additions are Christmas guinea pigs, courtesy of the Beanie Baby folks. I also make Christmas cookies – something my mother and “aunt” Meredith found time to do with us back when I was small. I still make some of the same recipes. I have an enormous collection of cutters. My friends and family have become accustomed to finding Christmas pick-up trucks, rhinos, and coyotes among the more traditional trees, bells, and stars. Jim handles the decorating. He lets out his inner five year-old and the sprinkles are bright and gaudy. Amid the usual green and red are orange, hot pink, yellow, violet, and blue – in a few cases all on the same cookie! But our most important holiday tradition has nothing to do with things to make or eat. It has to do with people. We don’t live close to any of our family, so we kicked off the celebrating this past weekend by being enfolded into the Mumma household for a warm and lively party that ended with people from eighty-six to about ten gathered in the living room discussing, of all things, geography! Whenever possible, we do get together with family, either here or somewhere else. So in this winter-tide season, Jim and I send our holiday greeting to all of you, no matter what tradition you practice or even if you practice none at all. May our best wishes come to you and yours! Recently, Jim and I were going through some photos he’d taken. (I don’t take photos. I don’t even really like to handle a camera). A Joshua Tree -- Or Is It? When the one over on the right came up, I started laughing. We shared a laugh. Jim somehow managed to miss Dr. Suess, so it wasn’t until he and I got together that he learned about those strange and wonderful stories. We started with the video of How the Grinch Stole Christmas. (Almost time to watch that one again). Then I brought home Fox in Socks. Jim had heard part of this one because I can recite the ending almost letter perfect these many years later. It was my sister Susan’s favorite book when she was little and the grand finale is engraved in my memory. I gave Susan’s first son a copy of Fox in Socks when he was small. I believe firmly in sharing the wealth. “It could be a tongue,” Jim offered. “I think I missed that one,” Jim said. On some gut level, I found I was protesting this conclusion, but certainly my friend has a point. Even where “coming of age” rituals still exist – the Catholic sacrement of Confirmation springs to mind, as does the Jewish Bar/Bat Mitzvah – these rituals are not part of the culture as a whole, merely part of the religious sub-culture. That made me think. In pre-technological cultures, coming of age rituals were often linked to religion. The first example that I thought of is the Apache Da-i-da, a coming of age/ puberty ritual for young women. In this ritual, the girl would run various “races” (I use the word in a qualified sense since the girl often ran alone and was required less to maintain speed than to show herself as surefooted). When running her Da-i-da, the girl wore traditional clothing and was taught that she embodied White Painted Woman, one of the deities. At the conclusion of her ordeal, the girl was considered able to bestow the blessings of White Painted Woman on those famiy and friends who had gathered to witness the ritual. These puberty rituals did not die out with the coming of technology – or with the separation of religion and private life. 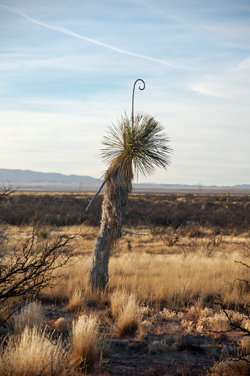 Among the Spanish-speaking cultures of New Mexico, the quinceaera, remains very important. I’ve read many articles in which modern practioners stress that, although to an outsider the quinceaera may look like nothing more than a big “coming out” party, many families emphasize that the celebrant now will be expected to assume a more adult role. Maybe that’s the problem with modern “coming of age” rituals. Although the young person is told on a given day that day he or she is an adult and will be expected to take on an adult role, the next day he or she is relegated to a child’s role again. Maybe for the ritual to have any meaning, the responsibilities must change. Certainly, the modern United States is conflicted on this issue. I started considering various events that many young people – robbed by our culture of genuine “coming of age” rituals – have substituted on their own. Turning eighteen is another landmark. At that point, you are considered old enough to vote. You can be drafted (if there is a draft) or enlist in the armed forces. If faced with criminal procedings, you’ll be tried as an adult. In most states, you can marry without needing the permission of your parents. When I was in college, eighteen was also when you were also considered old enough to legally drink alcohol. What type of alcohol varied from state to state. In some states, only beer and wine were permitted. In others, a person of the same age could drink “hard” alcohol as well. So another mixed message was sent. You’re an adult with enormous social responsibilities and privileges. Or are you? Today, twenty-one is the final age-related landmark. At this point, even the provision against drinking alcohol is removed. However, do most celebrate this landmark with a decorous glass? No. Increasingly, twenty-first birthdays are an excuse for the exact opposite, for wild and rowdy displays of excess. What do you folks think? Are coming of age rituals out-dated? Still present, but in different forms? In need of ressurection as a custom? Let me know! Your opinions could shape a future project. element in the “Breaking the Wall” books (Thirteen Orphans, Nine Gates, and Five Odd Honors). I do play, in fact, although I wouldn’t call myself a sophisticated player. We usually play without using limit hands. This keeps the strategy on a fairly simple level, so we can go for months between games without forgetting the elements. 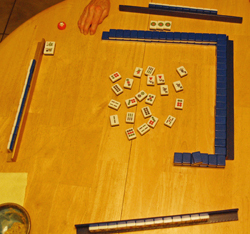 This past Thanksgiving holiday, since my mom was visiting, we settled in for a couple of three-handed rounds. Luck was with me. I managed a couple of five-hundred-plus point hands that put me well in the lead both nights. (It’s amazing what a bouquet of Flowers or Seasons will do for your score. I got one each night). Mom and Jim were very gracious about Luck playing favorites and settled in to competing with each other. Luck also extended her gracious hand to me during our Thanksgiving game of Trivial Pursuit with our guests Sally Gwylan, Chris Krohn, and Pati Nagle. I managed to fill in my “pie” and raced for the middle. There was a heated debate as to whether I should be required to answer Orange (Wild Card) or Green (Sports and Leisure). Wild Card was chosen and I got the right answer. (Oddly, I can’t remember the question). For once, I could even have answered Sports and Leisure. (“What state is permitted to compete separately in international surf-boarding competitions?” The answer was “Hawaii”). So everyone decided I’d earned my win. I guess you can tell that I really like games where people interact with each other. I’m not much of a bridge player. I can never get the bidding straight. I’m lousy at poker. However, give me a game where there’s plenty of chatter, where luck (or lack of it) keeps anyone from feeling they’re “dumb,” and I’m in my element. This preference extends to role-playing games as well. Jim and I play some computer games (usually as a team against the computer). I’ve even been part of the writing and design of a computer game (Chronomaster). However, my role-playing games of choice remain those where I get to interact with other players around the table, rattling dice, and play-acting. Sure, many on-line computer games have windows for messaging other players, but I miss the laughter, the moments when someone tosses out a bad pun or bursts into song. “Real Time” computer games actually make me a little edgy. I don’t like the need to push, push, push to keep up with the unfolding scenario. Last time I role-played, we started a historical Viking game that Walter Jon Williams wanted to run. A side comment about all the places the Vikings managed to reach (including Constantinople) segued into a spontaneous outburst of “It’s Istanbul, not Constantinople” (and on and on). This moved into a quick discussion of songs that stick in your mind. We agreed that this one would probably make it to outer space and be sung on planets long after that city had been forgotten.